Steal weapons. Improvise gadgets. Evade capture. Uncover the conspiracy. On the run and fighting for your life, you are freelance journalist Matt Carter. Twelve hours after arriving in Moscow for a routine story, you've been stripped of all possessions, beaten unconscious and thrown into the KGB's political prison. Caught in the midst of an international conspiracy that aims to control the U.S.S.R., you are now on your own behind the "Iron Curtain". 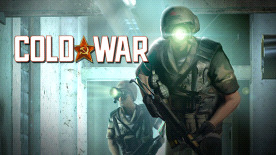 Using only recovered weapons and improvised gadgets, you must now evade and eliminate special Soviet forces and defeat the conspiracy or risk being either killed or sent to a remote Siberian prison camp. Collect and combine objects to create useful and deadly gadgets. You never know when a screw or a dirty old rag will come in handy. © 2005 Mindware Studios s.r.o. Licensed exclusively to Nordic Games Licensing AB, Sweden. DreamCatcher Interactive design and mark are trademarks of Nordic Games Licensing AB. All other brands, product names and logos are trademarks or registered trademarks of their respective owners. All rights reserved.